Richfield was an ordinary place. So much so that I’m at a loss to come up with a clever title for this post. But but but the drive to Richfield, now that was something to blog home about. It was one of the finest on this journey. Much of the drive looked something like this. Passing through Hanksville we stopped and checked out the cool and quirky Kiteley’s Place. 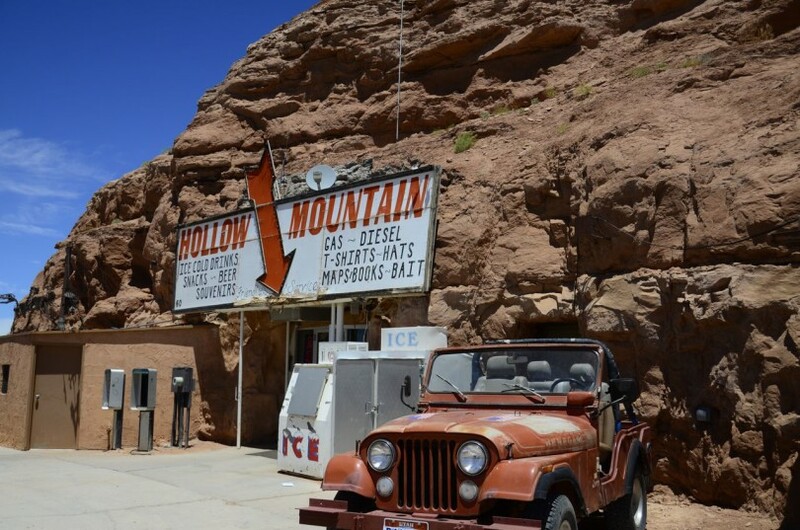 Moments later at the junction of 24 and 95, we found ourselves at the Hollow Mountain Gas Station in Hanksville. I walked into the convenience store to find the bathroom. The entire joint is carved out of the mountain, rock, it’s just a big rock hill, really. Not only is it nice and cool in there, but you a giant section of rock is jutting out into the terlet area. In Torrey, we stopped at Capitol Reef National Park to check out the red red rocks and the petroglyphs of the Fremont people found along 24 in the Fruita Rural Historic District area. 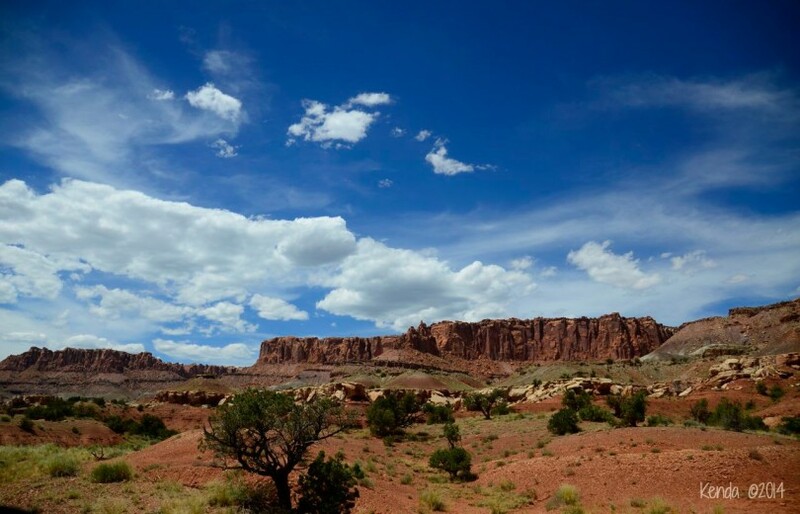 Learn more about Capitol Reef here. Panorama Point, also part of the Capitol Reef National Park is absolutely worth the stop, and a hike around the Chimney Rock trail as well. One section is strenuous. Bring water. We stayed at the Best Western Richfield Inn. It was clean enough, cheap enough, dog-friendly enough and comfy enough. What more can I say? It was a Best Western in a hot, Hot HOt HOT small town. I looked out the window and saw the Subway Sandwich shop where we bought our dinner. The gray skies, the gray macadam, and the gray horizon all made for a gray memory of a just passin’ through kind of place. There is nothing so American as our national parks. The scenery and wildlife are native. The fundamental idea behind the parks is native. The parks stand as the outward symbol of this great human principle. 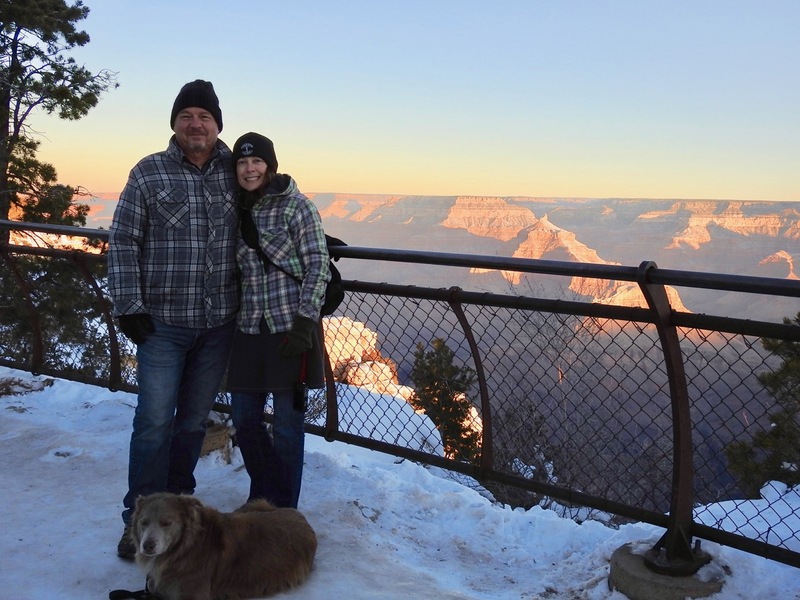 The establishment of the National Park Service is justified by considerations of good administration, of the value of natural beauty as a National asset, and of the effectiveness of outdoor life and recreation in the production of good citizenship.